The city of Nagasaki, meaning “long cape,” derives its name from the headland that juts out into the sea. 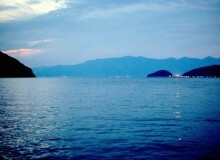 It was Nagasaki’s proximity to the sea that made the city an important port center throughout the history of Japan. During the 1550s, many Portuguese ships began to arrive in Nagasaki along with missionaries looking to spread Christianity to Japan. But, in the late 1590s, many Japanese leaders feared being conquered by Western nations and ousted the missionaries. 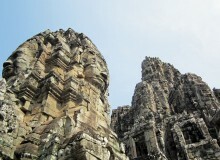 There were arrests and killings, and many churches were destroyed. Eventually, Japan isolated itself from the rest of the world. No one from Japan was allowed to leave the country and international trade was restricted to a single port, in Nagasaki. Consequently, Nagasaki became the bridge between Japan and the West for a little over two centuries. 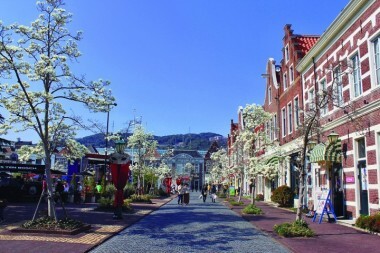 It’s not surprising, then, that the influences of the Portuguese and the Dutch still remain in Nagasaki. Nestled between the slightly shabby-looking Japanese houses, there may be a church. Or turn any corner, especially near an attraction, and there will be at least two or three castella shops. Castella is a specialty of Nagasaki and originates from the Portuguese sponge cake known as Pão de Castela, which means “bread from Castile.” Besides churches and sponge cakes, there are two attractions that are prime examples of the long-lasting Western influence on Nagasaki. The first is Glover Garden, a park dedicated to Thomas Blake Glover. Glover was a Scottish merchant who made great strides in business and also aided Japan’s industrialization. Mitsubishi Corporation of Japan and Kirin Brewery Company actually come from business deals he made. 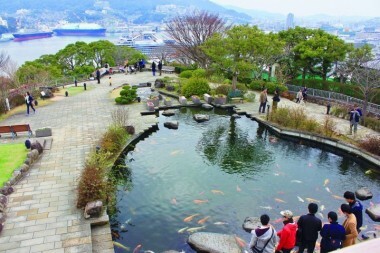 One of the park’s key features is the home he built in Nagasaki; it is the first Western-styled building in Japan. The moment you step past the Glover Garden sign, surrounded by green leaves, the tall shrubs act like walls, making you forget about the outside world and enveloping you in a secret garden-like space. On a warm day, the sun happily shines down on the flowers that dance along with the soft breeze. The first stop on the path will be the large koi pond. 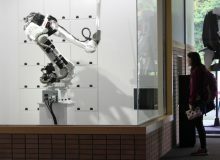 The house acts as a museum and explains what Nagasaki was like back then. The balcony on the second floor is a great place to truly take in the view of the pond and the cityscape. The path through the park is a delight with all the different kinds of flora along the way, and there are quite a few places to sit and soak in your surroundings. 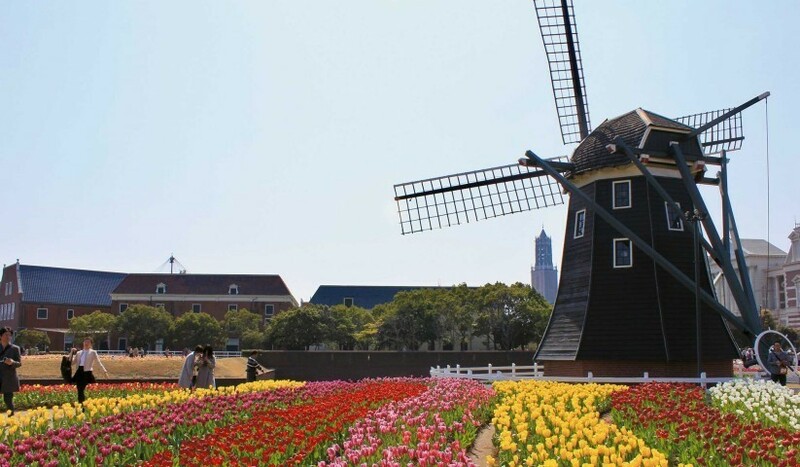 The second attraction is Huis Ten Bosch, which is Dutch for “House in the Woods.” Just like Glover Garden, the theme park transports you to a new place—in this case, a new country. The park is modeled like a Dutch town that you can explore by visiting its variety of restaurants, bakeries, souvenir shops and attractions. The best part of the park is really the moment you enter: fields of bright pink, yellow and red tulips welcome you. The breathtaking view is heightened by the windmills spinning amongst them. There is also a castle further within the park with even more flowers you can enjoy. In addition to Glover Garden and Huis Ten Bosch, exploring other parts of the city will give you a more complete idea of Nagasaki. 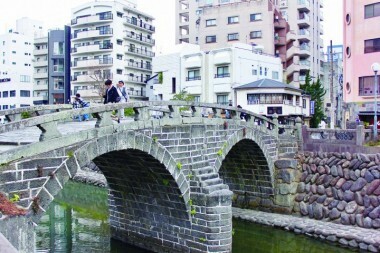 The Megane Bridge area is a good representation of Nagasaki’s architecture and ambience. Nagasaki offers an incredible and unique history which certainly makes it worth a visit.